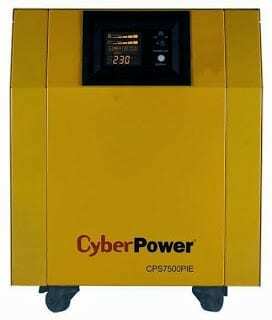 CyberPower Inverter offers backup power solutions to consumers and businesses in Nigeria. CyberPower Inverters are available in power capacities ranging from 1KVA to 7.5KVA and are suitable for homes and small businesses. CyberPower Inverter Price in Nigeria ranges from 33,000 to 1.5 million Naira depending on the rated power output, whether or not battery and/or installation is included, your location, and bundled accessories. CyberPower Inverters are built with Nigeria in mind. They are rugged, offer pure sinewave output with AVR and built-in UPS for your computer or TV/decoder. CyberPower inverters are smart enough to tell you the level of loading and the battery level. They also feature reverse polarity warning in case you attempt to connect the battery wrongly. CyberPower Inverter is micro-controller driven with fast charging feature with unlimited battery capability. CyberPower Inverter also feature reverse polarity warning that will alert when you are about to connect the battery the wrong way. CyberPower Inveter will also alert you when the battery is low. There is also an alert for overheating and overcharging. The Inverter offers an LCD panel that offers useful information about the state of the battery and inverter. CyberPower Inverter price may or may not include the installation cost. The battery may not also be part of the price. An SMF battery costs 50,000 Naira for 200 Ah capacity. Accessories like the battery rack may also be an option. As a rule the higher the price the more value you get.